@Govnah got it installed and working on a ReadyNAS 516. I linked to his post below as well as tagged him so he will see this post. He might be able to answer your questions directly. I think that beyond the basic install you will definately need ffmpeg put into the Codec section and I think lbzip2. This only happens with the ‘easy install’. However it happens on Ubuntu and I’ve just tried it on an arm device and same thing. I thought I should post it here so I have a place to say how I fixed it, or if I don’t Roon support might step in and fix it since it’s now happened a couple of times on a couple of different linux distros. Is it correct to say Roon supports QNAP and Synology @Rugby? Or would it be more accurate to say that these companies support Roon, and if you want Roon within their marketplace it is they that need to initiate this? Just a thought. The Synology install package was generated by @crieke initially as another forum user just helping out other forum users. As far as I know, Synology had nothing to do with the Roon app. But, I poked Christopher above and he might pop in and give the specific info. This project was a collaboration between the Roon Team and a member of the Roon community: Chris Rieke! Chris had started working on the Synology version of Roon Server on his own, so we contacted him and arranged to work together on these projects. Chris will be involved in the maintenance and support for both of these NAS packages in the future. Roon Server for QNAP can be installed from the QNAP App Center (under " Entertainment "). Download links for the Synology version of Roon Server, as well as detailed installation instructions can be found on his site. Verify that the ReadyNAS is running version 6.9.5 If not, then update to that version. 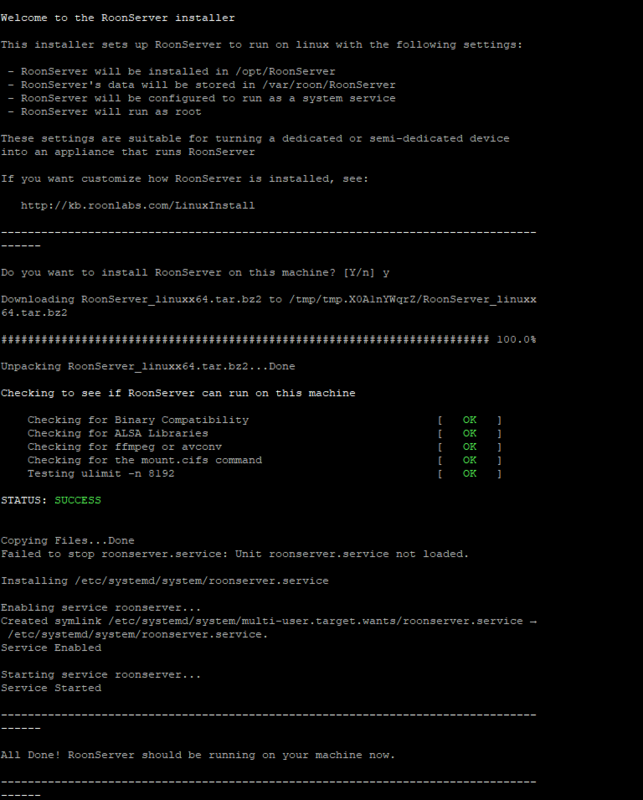 Download RoonServer Linux installer from Roon. Wow, fantastic work! Just a couple of questions. What “data location” should I copy the installer to? Second, how do I set up the database to run on the external SSD that I have plugged in to the USB3 port in the back of the NAS? Third, I have already started to use Roon on my iMac temporarily and have customized (fixed) the database listings, such as merging artists, adding images, etc. Is there a way to back that up and migrate it over to the NAS once I get Roon up and running there? On my NAS, on one of the shares, I use a share call Files. I made a directory there, call RS, and then copied the downloaded software to that location from my computer. At the Linux command line in your SSH session, you will have to navigate the Linux file structure to get to that file. My setup is different so I cannot give you a direct line to use. As far as I know, the ReadyNAS do not have that capability to choose an SSD cache drive. The Qnap and Synology package installs have the option to select a Roon database location. Since there is no ready installation package, you would have to modify the Roon’s installation script to indicate an alternate location; which I would assume would be device and user dependent. And even then, I’m not sure it would work. We might ask @Govnah if he some ideas. I have not experimented with such as it was outside the scope of my immediate test, which was just to get Roon installed, load some music and listen to the server. I might indeed tackle this next, after I get an SSD enclosure to re-use one of the many SSDs littering my workbench. Figured I’d post to help those who are not as familiar with Linux. Enjoy, I know I am!